Fritz St Jean, Oil on Canvas. Zoo Animals. Signed bottom right. Shot with & without frame to reveal artist signature. Born in Port Au Prince, Fritz St. Jean emerged as one of Haiti’s most illustrious self-taught artists. 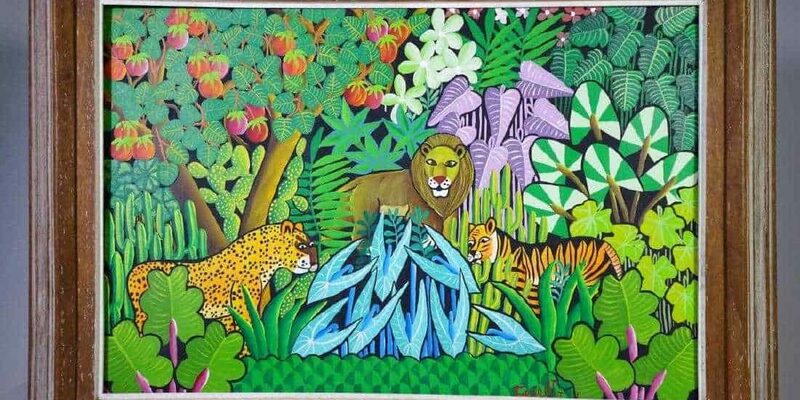 Initially, his style consisted of painting animal and jungle scenes on canvas. However, in 1980, St. Jean broke away from the staid pastoral themes to memorialize his hopes and dreams for Haiti through his paintings. Being widely viewed as socio-political commentaries on the dichotomous realities of Haitian life, St. Jean’s paintings transport the viewer to scenes of mysticism, idealism, and humanity all in one. He is noted as a master in color and detail as his works are continuously punctuated by the use of bold colors and fine lines. Often, his paintings celebrate Haiti’s religious culture in Voodoo and encapsulate its rich history. Paying tribute to a country that was once called La Perle des Antilles (The Pearl of Antilles due to its natural beauty and countenance), St. Jean’s paintings are artistic love notes to his homeland. Suffice it to say, Haiti continues to be the source of St. Jean’s inspiration. Fritz St. Jean has made notable achievements throughout his artistic career. Winning several top prizes, including the First Prize in the 1983 Air France poster competition, Mr. St Jean’s works were featured in the landmark exhibition “The Sacred Arts of Haitian Voodoo” at the American Museum of Natural History in 1998. Not to mention, his work has been published in many art books and exhibited at various art institutions worldwide, including shows in France, Italy, Kenya, and Switzerland. He currently lives in New York.